Different sizes of Tributary Unit frames are used in SDH & we have seen basic SDH multiplexing structure in earlier post. Different TU-Sizes provided in SDH are TU-11, TU-12. TU-2 and TU-3 . 1. TU-11 : A TU-11 frame consists of 27 bytes, structured as 3 columns of 9 bytes. These 27 bytes provide a transport capacity of 1.728 Mbps at a frame rate of 8000 Hz. It will accommodate the mapping of 1.544 Mbps DS1 signal. 84 TU-11's can be multiplexed into a STM-1 frame. Structure as as shown below. 2.TU-12 : A TU-12 frame consists of 36 bytes, structured as 4 columns by 9 bytes.These 36 bytes provide a transport capacity of 2.304 Mbps at a frame rate of 8000 Hz. It will accommodate the mapping of 2.048 Mbps E1 signal. 63 TU-12's can be multiplexed into a STM-1 frame. Structure as as shown below. 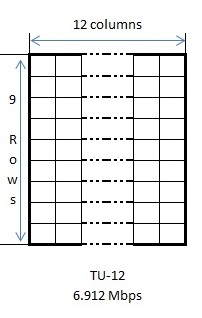 3.TU-2 : A TU-2 frame consists of 108 bytes, structured as 12 columns by 9 bytes.These 108 bytes provide a transport capacity of 6.912 Mbps at a frame rate of 8000 Hz. It will accommodate the mapping of DS2 signal. 21 TU-2's can be multiplexed into a STM-1 frame. Structure as as shown below. 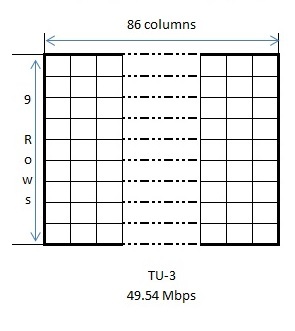 4.TU-3 : A TU-3 frame consists of 774 bytes, structured as 86 columns by 9 bytes.These 36 bytes provide a transport capacity of 49.54 Mbps at a frame rate of 8000 Hz. It will accommodate the mapping of 34 Mbps E3 signal and North American DS3 signal. 3 TU-3's can be multiplexed into a STM-1 frame. Structure as as shown below. Great information, really nice to read about this.